A cat’s tail can tell you many things, like whether they are happy or playful or about to pounce – if you know how to read it. However, some cats’ tails have an added feature – a clearly discernible kink in the bones of the tail that give it a crooked bend. There are a few reasons that these occur. One of the most common reasons that a cat will have a kinked tail is due to an accidental break of some kind. This can be caused by a person accidentally stepping on the tail or other types of physical stress to the tail bones. Just like if you broke a bone, you should consult your veterinarian immediately if this happens. Your vet can analyze the tail and make recommendations on treatment options and remedies, as well as offer pain relief if your cat is in pain from the injury. If the tail is broken heals improperly – as is often the case with strays or wild cats who suffered a tail injury – it can result in a noticeable kink. After recovery, the bend should not cause your cat pain, but he or she may require a few days to get used to the new sensations of walking, playing and running with a differently shaped tail. 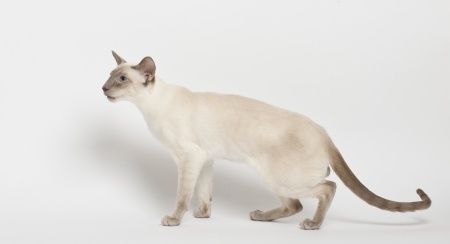 Some cat breeds – the Burmese and Siamese, in particular – can be born with a kinked tail, notes Cat World. This doesn’t cause the cat to feel any pain or discomfort, and as it is part of them from birth, they generally don’t suffer from any balance or movement issues. Legend even says that a Siamese princess used to keep her rings on her cat’s tail while bathing, which is why that breed is especially prone to having crooks in their tails. Just like cats come in many different shapes, sizes and colors, they can have different tail styles as well. At The Cat’s Inn, we also offer nearly as many configurations and color options in our cat townhouses and condos as there are cat breeds. Take a look at our different options online, or contact us today to learn more. In Thailand the majority of cats have either really short and/or crooked tails, we are told this is caused by inbreeding. I guess that falls under genetics but could also be mentioned as a separate cause.